DeSanto Realty Group Management Company offers comprehensive asset management for existing commercial and residential properties. The company puts five decades of real estate and asset management to work to offer our clients a management strategy that enables the property to meet or exceed projections. 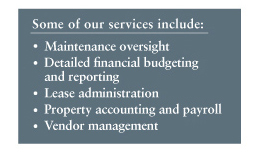 We have an established, experienced team of managers, accountants and customer service professionals who work to maximize the potential of each asset. We currently handle management responsibilities for 200-plus investors, with interest in 10 properties, including 925,000-square feet of office/flex space and nearly 2,000 units in six multi-family communities.